~~ Dr. Seuss, How the Grinch Stole Christmas. When it comes to Christmas, calories don’t count. 😆 Amazing food and time with family signify the holidays in the Andersen family. The food of course does “come from a store,” but the pleasure that comes in preparing and enjoying the food define Christmas for most of us. So, we “live a little,” “throw caution to the wind,” splurging on luxurious, less-than-healthy, even fatty ingredients. OMG! Is the sky falling? NOPE. I love Christmas morning breakfast with my family. My husband makes a pot of freshly ground dark roast coffee, and my sous chefs (sons) and I whip up something special. We tend to favor bacon and waffles, but the bacon typically stands alone. This year, I had the privilege of testing Bob’s Red Mill Protein Pancake and Waffle Mix. Always one to insist on a good protein boost to start the day, this was a Bob’s Red Mill product I was really excited to try! I love a basic waffle or stack of pancakes, but let’s face it, they’re carb loaded and completely lacking in protein. Enter Protein Pancake and Waffle Mix. This pancake and waffle mix packs 15 grams of protein per serving. That allowed me the flexibility to add a bit of bacon for flavor, and not worry about starting the day with enough protein! If you’ve followed Beyond Mere Sustenance for awhile, you may be aware of my enthusiasm for Bob’s Red Mill Products. If not, let me get you up to speed: Bob’s Red Mill brings you healthy, stone-ground, minimally-processed foods… “from mill to table!” In addition to their delicious, healthy foods, they offer an amazing variety of products for individuals with dietary restrictions like “gluten free,” “paleo,” and “vegan.” Check them out! These waffles come together surprisingly quickly! Start the Pomegranate-Blood Orange Syrup simmering on the stove. While it simmers, plug in the waffle iron, whip up the waffle batter (bacon needs to fry) and mascarpone cream. Finish the syrup, and start a waffle. Don’t forget a good cup of joe or a mimosa. 😀 Enjoy! 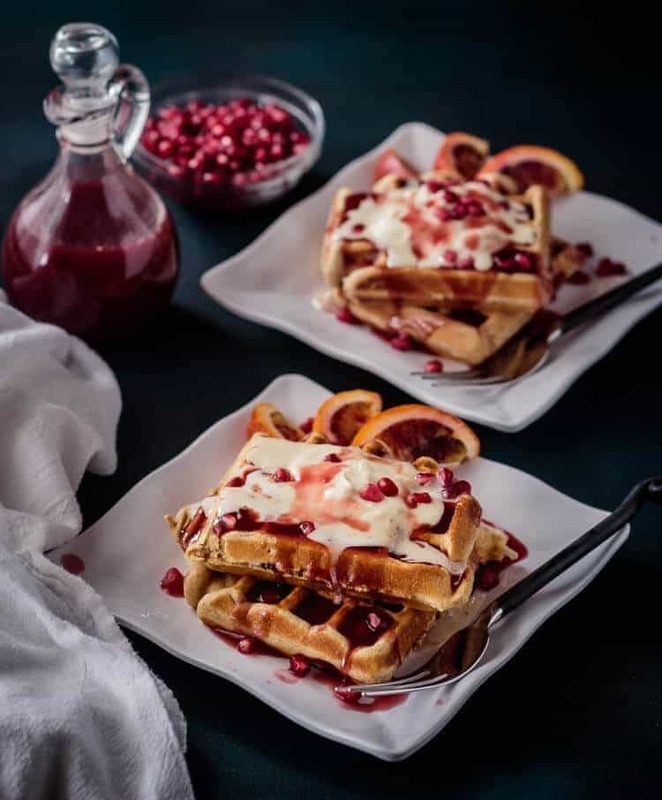 Festive days call for an extra-special breakfast... Festive Christmas Waffles with Pomegranate-Blood Orange Syrup is sure to please young and old alike, and using delicious Protein Pancake and Waffle Mix means your family starts the day right! To a small saucepan over medium-high heat, add the juices, water, sugar, cinnamon stick, and salt. Bring to a boil, then reduce heat to a simmer. Simmer 20-25 minutes until thickened to a syrupy consistency. (If a thicker syrup is desired, make a slurry of the water and cornstarch, add to the syrup, bring to a boil to allow the cornstarch to activate and cook to remove the starchy taste). Cool. While the syrup simmers, prepare the mascarpone cream, and fry the bacon. For the cream, add cheese, zest, juice, and sugar to a small processor. Blend until smooth. Add half n' half or cream to desired consistency. Preheat the waffle iron. Mix all ingredients for waffles together until combined, but do NOT over stir. Ladle into waffle iron. Cook until crisp and golden brown. 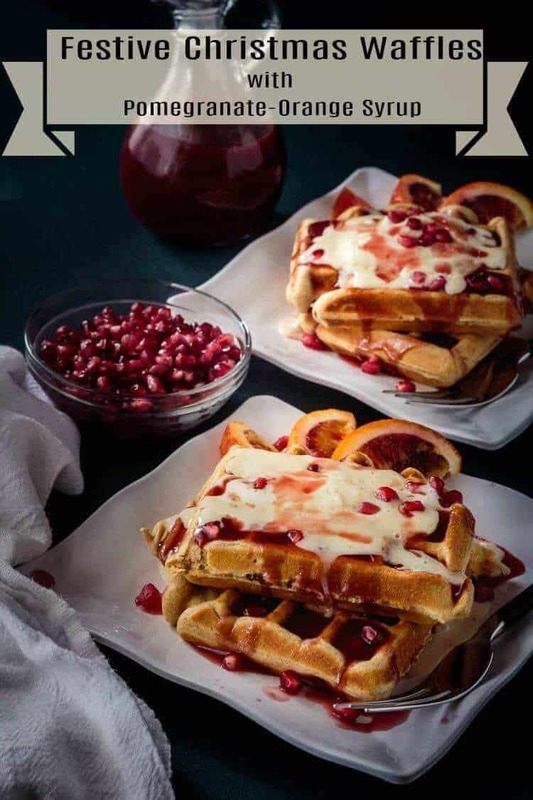 To serve: Pour syrup over waffle. Top with a scoop of mascarpone cream. Garnish with pomegranate arils if desired. Enjoy! 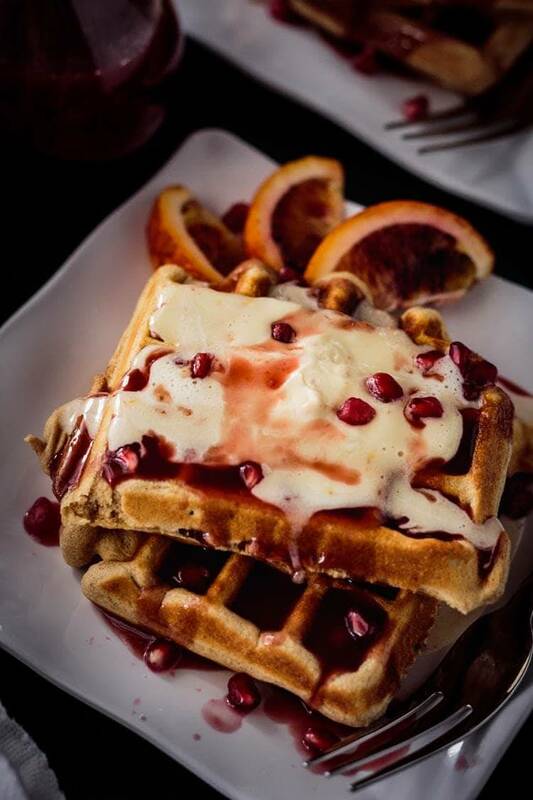 Both the waffle and the mascarpone cream call for orange zest. I find 3 small oranges yields about 3/4 cup of juice. I zest all 3 oranges prior to squeezing the juice. 2/3 of the zest goes in the waffle batter, and 1/3 into the mascarpone cream. Exact amounts are not important. If using a different brand of waffle/pancake mix, add the liquid/fat/egg (if appropriate) of the package instructions. The bacon, zest, and cinnamon amounts remain the same. Macronutrients (approximation from MyFitnessPal.com): 450 calories; 20 g protein; 52 g carbohydrates; 19 g fat. Serving size for macros is 1 waffle with 1/4 of the mascarpone cream, and 1/8 of the syrup. I want to have these again! 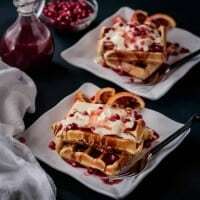 You know how I love waffles, and the orange-pomegranate syrup is a nice change from maple!